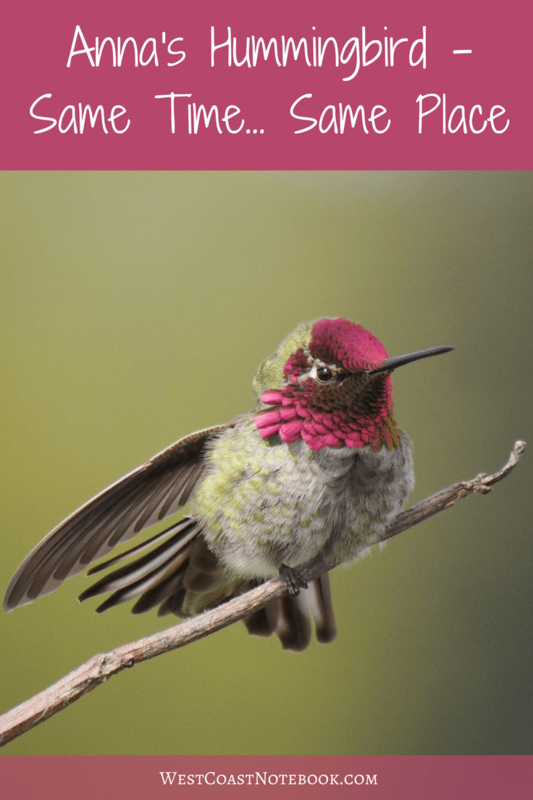 There is one spot that an Anna’s Hummingbird returns to year after year with precision timing. I am so fortunate to have found this little bird in plain sight on one of my walks. People jog by him, walk by him, run dogs by him and he ignores them and holds fast to his territory. The strangest thing is of all the people that walk by him, very few notice him. I’ve never heard anyone say “look at the hummingbird” unless I’m taking a picture, and then they pause to see what I’m looking at. It’s like he’s invisible to the world at large. During the winter this little bird disappears and yet every spring he shows up to claim his piece of property and to woo his girl. Sometimes it’s the same bird, and I know this because, for two years running, the bird that came had a hooked beak at the end. But this year, it’s a different bird or else he got a beak straightening when he was down south. 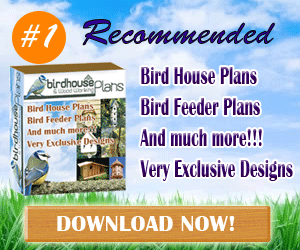 What is amazing is that the birds come to the same location and roost on the same trees at the same time each year. How do they know? What impels them to claim the same spot year after year? There is nothing special about the place. 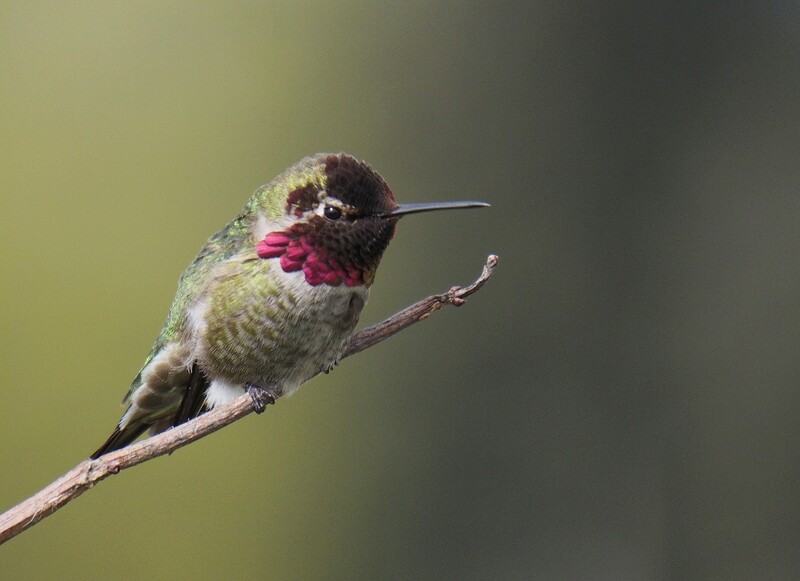 It’s a well-walked path that sees lots of traffic every day and the hummingbird hangs out at four different spots. It claims two trees (shrubs actually) about 7 feet high on the left side of the path and another two further down the path on the right-hand side. This area is all open with no real place to have a nest but day after day he defends it against all trespassers. There are no houses around, so he’s not coming to a hummingbird feeder, but like a spawning salmon returns to the same place each year. This one kept sticking out its tongue. Almost like it was tasting the air like a snake, but it was probably on the lookout for small bugs. Their tongue is quite a bit longer than their beak and when they have it out fully, it’s like having two beaks in one. One of the reasons that I so enjoy this particular Anna’s hummingbird is that when it perches, it almost always at eye level with me. As a photographer that means that the background becomes a nice soft muted colour and the bird stands out. 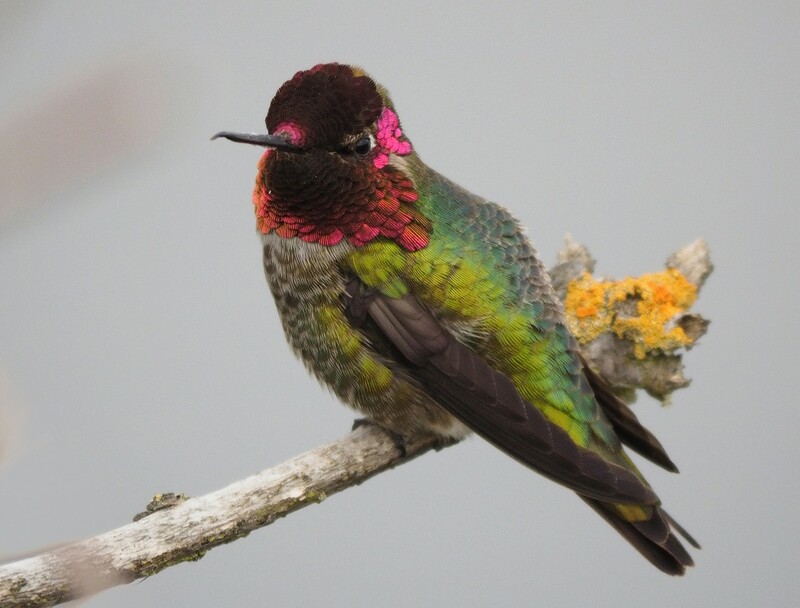 In the picture below, you will only see a little pink at the throat or gorget of the hummingbird and the rest appears black. This is due to the iridescence of the feathers at the throat and I could take a whole page to explain how it works, but this page had already done it for me if you want to read about it. What I find is that when the bird looks forward the gorget catches the light and it appears to be pink in the Anna’s case. 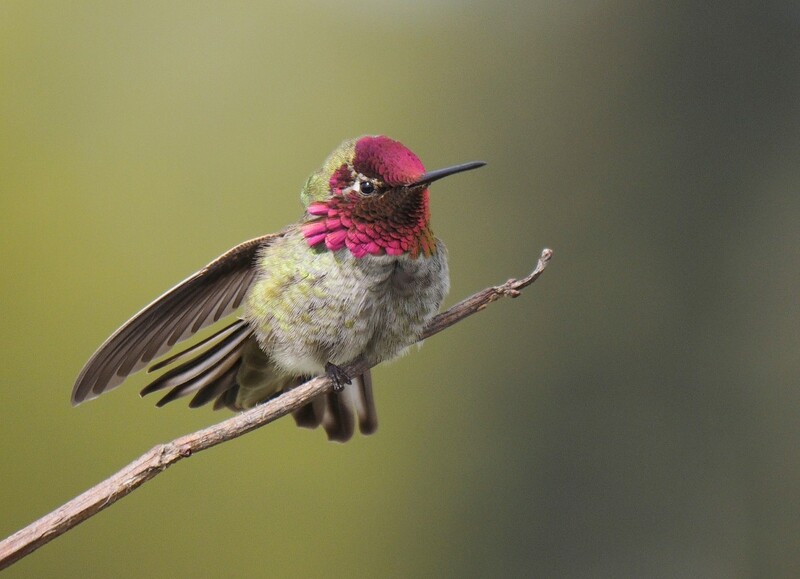 Other hummingbirds have different colours at their throats. For me, it’s all about where I’m standing, where the bird is sitting and where the sun is. When all these things line up, then voilà… the iridescence show through and he shines in all his glory. 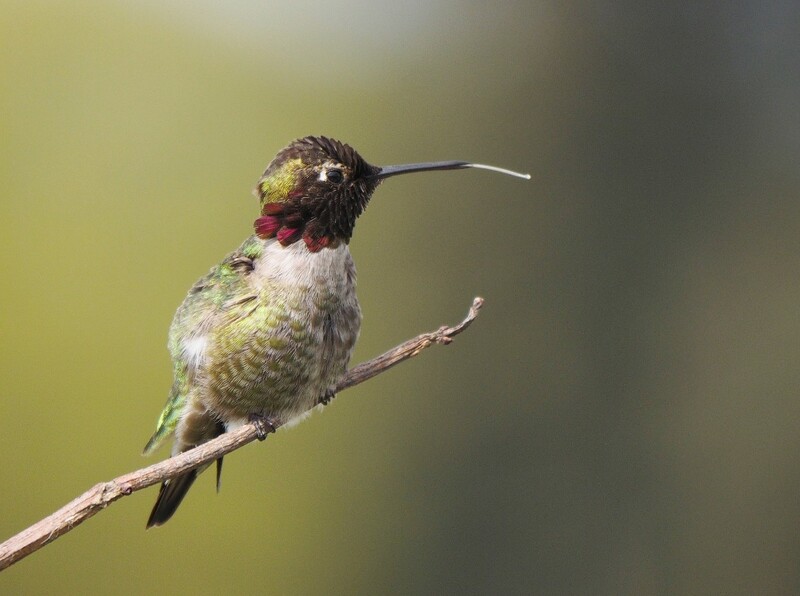 This hummer was stretching and preening while it sat on the branch in the wind. I threw out a lot of photo’s as they were blurry due to the branch and bird blowing in the breeze. I’m so grateful for my digital camera that allows me to take as many photos as I need to get it right. Who knows if this bird will be back next year, but if not him… someone will take his place… of that I’m sure.